Days at the beach, picnics, 4th of July fireworks, trips to the ice cream shop, and family vacations all make great topics for summer scrapbook pages. Highlight your favorite memories with a few carefully selected phrases and quotes. Use these phrase ideas to help you brainstorm fun summer layout topics for your scrapbook. They can be incorporated as page titles or used as captions for photos. 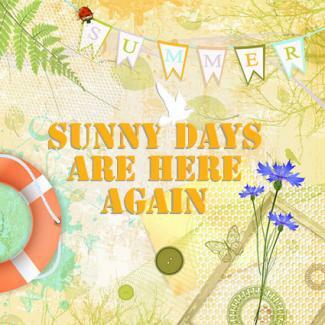 Sunny Days Are Here Again - Use this page title with a collection of random photos that make you think of summer, such as swimsuits on display at the mall or brochures used for planning your summer vacation. Fun and Fabulous Flip-Flops - This title is perfect for a look at your collection of comfy summer sandals. Water Babies - Use this phrase for a layout about your preschooler learning to swim or your older child joining the swim team. Just Add Water - A page about the winners of your family squirt gun fight would be a great choice for this phrase. Sun Kissed Sweethearts - Use this quote for a page about your teenager's first summer romance or a special summer date with your significant other. The Sweet Taste of Summer - Top a tribute to your favorite summer foods, such as watermelon, Popsicles, sweet corn, or freshly grilled burgers, with this catchy page title. Picnic Days - Pictures from a family picnic accompanied by recipes for some of your favorite dishes make for a fun summer scrapbook layout. The Dog Days of Summer - A page about your how your family helps Fido beat the heat incorporates your furry family member into your scrapbook album. Pool Party in Paradise - Use this page title with pictures of family and friends enjoying an afternoon in the pool. Bummin' at the Beach - This phrase can top a layout about your family's favorite beach activities, such as building sand castles, playing Frisbee, or working on your tan. Sunny Days and Starry Nights - Family vacation memories or a layout about an Independence Day celebration would work well with this title. Sweet Summer Smiles - Use this page title with pictures from a family reunion. Remember to clearly identify distant relatives you don't see on a regular basis, so you can refer back to the page before the next reunion rolls around. Beat the Heat - A list of all the things your family does when it's too hot to play outside, such as visiting the library for story time or checking out a matinee at the local movie theater. The Lazy Days of Summer - A layout about how summer changes your regular family routines. Every Summer Has a Story - Use this page title to highlight the best and worst parts of the season, according to different members of your family. School's Out by Alice Cooper - This song provides great inspiration for a page about the last day of school. 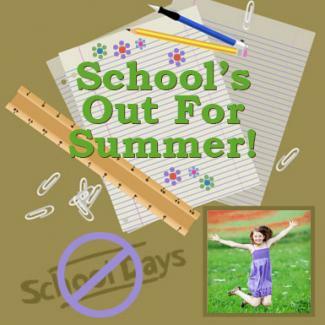 Photograph your children joyfully jumping up and down because "school's out for summer" and embellish with a "No" symbol over top of pencil and/or book clip art. Summertime by Billy Stewart - If summertime means the living is easy and the fish are jumping, this song is for you. Use a sampling of these lyrics to accompany pictures of your family's summer camping trip. Wipeout by the Beach Boys - The lyrics to this song are the perfect accompaniment for a page about learning to swim or surf. Make a wave background for your page with white cardstock and blue watercolors. Mat photos with a bright orange or yellow cardstock to add contrast to your page. Summer Nights from Grease - This song adds a 50s feel to pages about summer romances. Evoke memories of Danny Zuko and Sandy Olsson with a pink and black patterned background and carnival themed embellishments like cotton candy and ride tickets. Use quotes from the song to label each photo, tying them together with a "Summer Nights" title. California Gurls by Katy Perry - Even if you've only visited the state, this catchy summer tune works well to compliment pictures from your last bikini beach party. If your idea of summer fun is enjoying a good book at the beach, a page with summer-themed quotes by some of your favorite writers might be the perfect addition to your scrapbook album. Good Reads has an extensive collection of summer quotes to consider, including inspiration from classics like F. Scott Fitzgerald's The Great Gatsby and Harper Lee's To Kill a Mockingbird. These quotes are longer in length, so you can incorporate them into your layouts just as you would a section of journaling. Summer phrases and quotes make it easy to create meaningful layouts, since they are a natural complement to your journaling. Try experimenting with different fonts to add interest to your layout and create pages that will be precious keepsakes for many years to come.